Growing your own food in your kitchen garden or backyard garden helps you maintain a healthy lifestyle. It also helps the planet and the local economy. Would you like to eat freshly grown produce? What could be healthier and fresher than your own home grown organic foods! Growing organic foods at home is healthy and cost effective, and it may also help our economy and environment. The foods that you buy from the supermarket have to travel hundreds or even thousands of miles before it reaches your plate. Many of the store bought foods we have access to are processed and have a shelf life. Excessive packaging, storing and distribution of food can make the product lose its freshness. And it also adds to increasing carbon emissions. So, with the cost of organic foods rising, consider growing your own foods. It’s safe, healthy, can save you money and can even be a good source of extra income for you and your family. Growing your own food is actually easier than you’d think! You can use any amount of space available in and/or around your house for growing all types of plants. Select a sunny spot in your backyard, balcony or window sill. You can also start an indoor garden in containers if you can arrange artificial lights for your plants. Vegetables and fruit trees usually need six hours or more sunshine on a daily basis. Your garden also needs to be well drained because plants do not like to stand in stagnant water. Over watering is often a big problem for beginner gardeners. You can start your garden from starter plants or seeds. If you want to start a container garden, you’ll need potting soil and seeds or starter plants. For outdoor gardens, you can prepare your soil with organic fertilizers, or prepare your own organic fertilizers using homemade compost. Good healthy soil will produce good healthy plants. 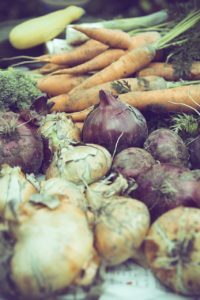 So, in order to get the best results from your kitchen garden outdoors, you’ll need to prepare your soil first. Your plants will need enough nutrients to grow, so make sure your garden soil is properly conditioned with organic nutrients. Chemical fertilizers can harm the natural ecological balance of your garden. They discourage the natural balance of worms and microbes and also tend to sip into your food, causing harm to your health! The best way to ensure good quality soil is to test your soil first. You can easily get a soil testing kit at the local garden supply store, which will allow you to get the pH balance and other nutrients present in your soil. You’ll be able to tailor your garden and treat your soil accordingly, as needed. You’ll need to remove grass and weeds, break up your soil, and also get rid of any rocks or hard substances. A raised bed is often a good idea if your soil quality is poor. 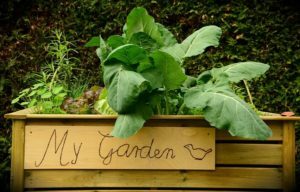 You can build a raised bed garden with wood, bricks or stones at small or medium scale, fill it up with high quality top soil and start planting. Adding organic fertilizers or compost from your kitchen waste is a great place to start! After you have prepared your soil and beds or containers, it’s time to choose your crops. Basically the right crops would depend on what grows best in your area during this time of the year and what you’d like to eat. Try experimenting with a few crops that grow well in your area. A simple salad garden might be a good idea to start with. Lettuce, cucumber, green peppers, parsley, and tomatoes make a good salad garden. Some of the microgreens grow well from seeds and they are last for multiple harvests. They don’t require much space and are easier to grow all year round! With enough sun, water and care, you’ll be able to harvest your salad garden crops within 20-30 days after planting. Check for bugs and weeds so that you can maximize your production. If you have raccoons, birds, or other animals around, you might want to add a protective net around your garden. 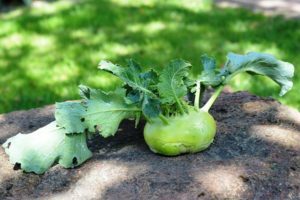 There are several organic methods for controlling pests and diseases, which every gardener has to deal with from time to time. A garden fence will definitely help keep deer and rabbits away. An organic garden at home can provide both food and extra cash for your family. You’ll reduce pressure on agricultural lands and resources, and also help the local environment and economy. Growing a garden at home is easier than you’d think! All you need is some extra space and time to get started. We hope our tips will help you get started gardening at home for organic food! To find out more, subscribe to our blogs. Also, join us on our Ecolonomic Action Team (EAT) Live webinars on restoration agriculture. Join for free and you’ll find most of our webinar replays and lots of cools stuff here. We also have amazing systems called Tower Gardens that you can purchase that will provide you with year-round Hydroponic Gardens. Click here to find out more about the amazing Tower Garden systems.